It's starting to look a lot like Christmas. What will you be doing this year? Gourmet food, fine wines, parties and presents? I know one of you is winning a pair of S$88 tickets to the WRX Wine Journey (draw closes tomorrow)! All well and good. But here's something that might bring even greater satisfaction. This year MINDS has teamed up with 18 Voluntary Welfare Organisations (VWOs) to give 5,000 Christmas Stocking goodie bags to disadvantaged or intellectually disabled children/adults. The MINDS Christmas Stocking Challenge 2011 (see Facebook page) would really appreciate your sponsorship of S$10 per stocking and they hope to get as many as possible by 15 Dec 2011. Each of these stocking goodie bags will be produced and packed by the intellectually disabled adults in the MINDS Sheltered Workshop program. The proceeds from your sponsorship will go to them as allowance for their livelihood. So you will benefit two parties by your gift. The stocking producers, and the stocking recipients. There is no minimum required. Even one stocking will do. If you are schooling, ask your friends to band together. If you are working, ask your colleagues if they will join this. Ask your boss or HR department if they'd like to contribute. Or simply ask your friends and family to help in this good cause. Just go to the website, download the sponsorship form, and send it in with your cheque. Or you can head down to the MINDS office at 800 Margaret Drive with a cash sponsorship (Mon-Fri; 9am to 5.30pm). I'm going to the office tomorrow to give my sponsorship for ten stockings. I know, times are tough for many people. My family's finances are at their tightest ever, but there are always those who have even less. Sometimes unimaginably so. Low-income families for whom a 90 cent piece of chocolate is off-limits (see story that inspired the MINDS Christmas Stocking iniative). And every week at Nadine's school, I see kids with all kinds of conditions, in limb braces, wheelchairs, oxygen tubes, hearing aids, and occasionally, some really esoteric medical contraptions. Tired as I am, I really should not complain that Nadine is always running recklessly all over the place. Because she can. 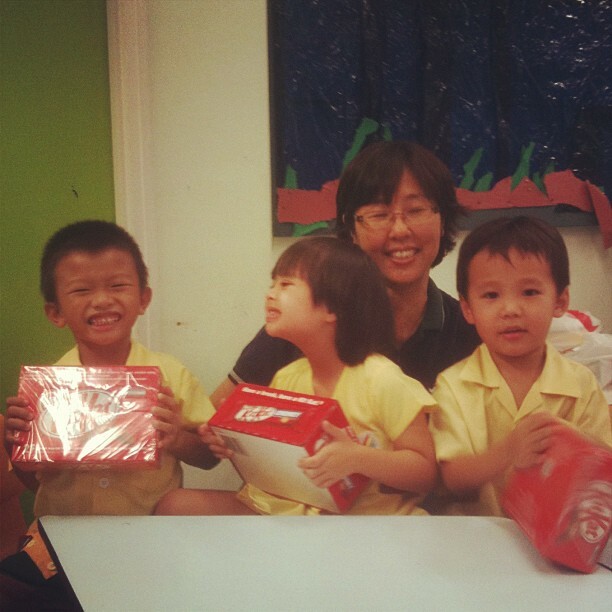 Nadine's school (Rainbow Centre Margaret Drive) is not in the list of beneficiaries, but the Yishun branch is. So she won't be getting a stocking, but the kids there did get S$200 worth of Kit Kat recently, thanks to a blog contest by Hpility who so graciously let me win. It doesn't matter whether you believe in karma or Christmas. Whatever little we can give, let's just do it. The lack of a Paypal account is a serious hinderance. MINDS should consider this next time.